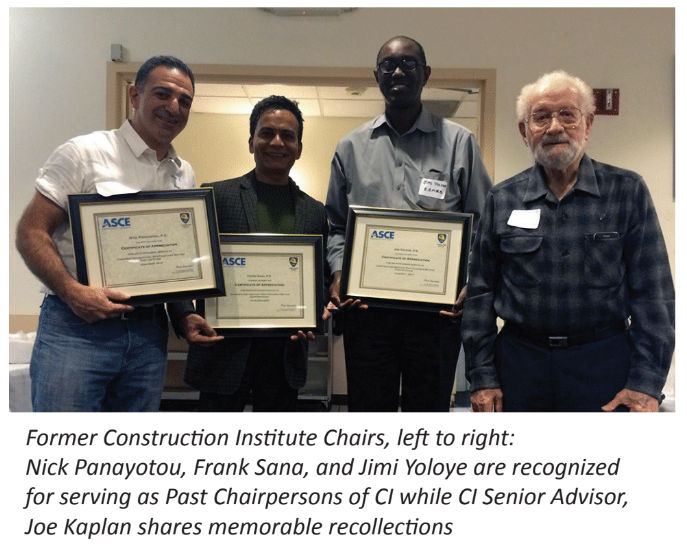 The American Society of Civil Engineers San Francisco Section lost one of our biggest champions and dedicated volunteers on February 28 with the passing of Joe Kaplan. He was a proud member of ASCE for 70 years, having joined as a student at UC Berkeley where he earned a BS in Civil Engineering in 1948. Joe was a licensed engineer and general building contractor in California and was the founder and president of Joseph Kaplan, Inc. The company was involved in infrastructure and marine construction, as well as industrial building construction and residential remodel and retrofit construction. Joe was extremely active as a volunteer within ASCE. He was the Chair of the Construction Division of the SF Section (now the Construction Institute – CI) in 1959/1960 and again in 1992/1993. He served the Section as Treasurer in 1961/1962 and continued to be active with the Section leadership until 2018, consistently joining monthly meetings as the CI representative and advising on all aspects of the association’s finances and investments. He was a member of several national ASCE committees, including Crane Safety. This committee has developed a policy on Crane Safety for ASCE and has published a manual on “Crane Safety on Construction Sites” which he co-autorhed in 1998. Joe won numerous awards within ASCE including the Region 9 Outstanding ASCE Life Member in 2009, the Region 9 Outstanding Member in Legislative Activities in 2015 and the S.F. Section’s prestigious H.J. Brunier Award for service in 2004. In addition to ASCE Joe served as an officer of the Engineering and Grading Contractors Association, the American Road and Transportation Builders Association and the Associated Builders and Contractors. He will be missed by our engineering community but his legacy will continue through his many contributions.